CorrectEnglish® is designed to provide academic and professional writers with guided feedback relevant to the exact type of writing. Powerful research and revision tools are embedded in the application to provide instant access to the resources needed, at the exact time they are needed. CorrectEnglish® frees documents from the desktop and brings them up to the cloud. There is no flash drive to remember, no fear of misplacing files, and no management of license registration needed. All work is securely backed up online and accessible on any compatible device. When revisions are completed, the writing can be downloaded, printed, or e-mailed from within the application; there is no proprietary lock on data. CorrectEnglish® displays menu items and revision tools in Spanish, French, German, Japanese, Korean, and Chinese. 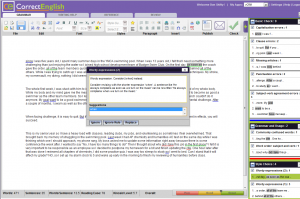 CorrectEnglish® remains accessible to nonnative English writers without sacrificing functionality, giving them the tools they need to excel within the context of their immediate needs. CorrectEnglish® uses the Internet to deliver features that are powerful yet convenient to use. It offers support for blog posting, revision histories, document sharing, and collaboration. New features are added regularly and will appear automatically when logging on. No downloads or reinstallations are needed to get the latest version of CorrectEnglish® Edition.